The launch of ‘Deep Water: the next step for offshore wind energy’ saw an enthusiastic media focus on the idea that offshore wind could provide Europe with enough electricity to power Europe four times over. The headlines were impressive, but that offshore wind holds massive potential for Europe is not news for anyone following the wind industry. EWEA has projected that offshore will see 40 GW installed capacity by 2020, equivalent to 4% of EU electricity demand, and 150 GW by 2030, meeting 14% of EU electricity demand. The significance of the Deep Water report was not only the potential for electricity generation, but the technological advances being made in the offshore wind industry. Floating, deep water turbines are an exciting development. A large part of the cost of installing turbines offshore is embedding foundations in the sea bed. Floating turbines bring obvious advantages in this respect. The report found that deep offshore designs are competitive in terms of the levelised cost of energy (LCOE) with bottom-fixed foundations in more than 5Om water depth. The depth of 50 metres is significant, as Mediterranean waters, for example, are too deep for offshore development with current commercial substructures (limited to 40m to 50m maximum depths), restricting development there, or in deep water in the North Sea or Atlantic. Offshore wind is a young industry, with rapidly evolving technology, and floating turbines are even younger. 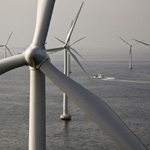 With the exception of two turbines, Europe’s grid connected offshore wind turbines rely on fixed foundations. The technology is still at a very early stage of development and in order to achieve commercial and large-scale deployment, the sector must overcome technical, economic and political challenges. If the challenges are overcome, the first deep offshore wind farms could be installed and grid connected by 2017. Read ‘Deep Water: the next step for offshore wind energy’ now.